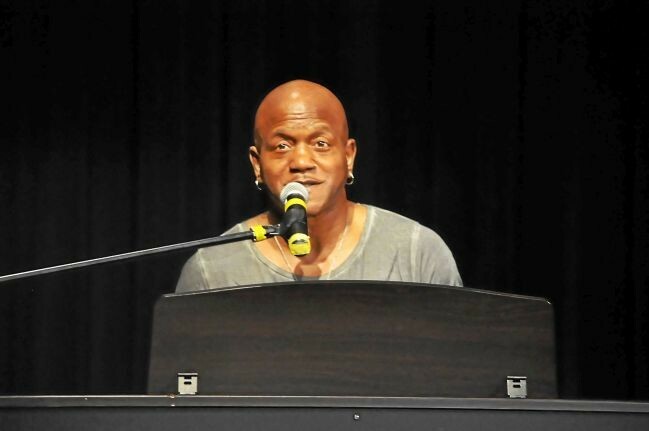 BENNINGTON — Steve Miller Band keyboard player Joseph Wooten is touring southern Vermont to raise awareness of the issue of homelessness in Bennington County. A partnership between Wooten, the You Are Never Alone Foundation (YANAF), and the Bennington County Coalition for the Homeless, the tour will conclude with a concert at the Dorset Playhouse, along with the Bondville Boys and Saints and Liars on Friday, starting at 7:30 p.m. Tickets for that concert are $20, and all proceeds will go toward providing wool blankets for the homeless. The concert is being called the “I Matter, You Matter Night of Music.” Tickets can be purchased at the Berkshire Bank in Dorset, HN Williams in Dorset, the Northshire Bookstore in Manchester, and Knapp’s in Bennington, or online at youareneveralonefoundation.org. Wooten visited Mount Anthony Union High School in Bennington, Burr and Burton Academy in Manchester, the Long Trail School in Dorset, Arlington Memorial High School, and Spaulding High School to speak with students about homelessness, taking advantage of their opportunities to get an education, and how inspiring people and making positive impacts on the lives of others is more important than being rich and famous. He also performed at a homeless shelter in Barre, at the Publick House in Bennington, on WBTN in Bennington, and at the Vermont Veterans Home in Bennington. Salley Gibney, the founder of YANAF, which is based out of Dorset, said that Wooten and her organization were connected over a coincidence. YANAF, in March, hosted its fifth annual “I Matter, You Matter Day.” Wooten, who has a song entitled “I Matter,” and owns the online domain imatteryoumatter.com, reached out to Gibney, saying that she should feel free to use his song and music video to promote that event. The two continued talking, and eventually Gibney asked if Wooten would be willing to come to Vermont to help support the organization. Since it’s founding, YANAF has sent over 151,000 wooden “caring coins” around the world, with the words “I Matter, You Matter” and “You Are Never Alone” engraved into them. After Hurricane Katrina, students from BBA and volunteers from YANAF brought coins down the New Orleans, to remind victims of the natural disaster that there were people out there who cared about them. Wooten began playing in a band with his brothers when he was five years old, living in Hawaii. His oldest brother, at 10 years old, was the leader of the band and Wooten’s music teacher in his early years. As children, the brothers opened for War (best known for their song “Low Rider”) and Curtis Mayfield, one of the most influential R&B and soul musicians of the ’60s and ’70s and a member of the Rock and Roll Hall of Fame. The group eventually signed a record deal in the ’80s with the same company that signed Whitney Houston. In 1993, Wooten joined the Steve Miller Band. The blankets that will be provided to local homeless individuals after Friday’s concert read, “I Matter, You Matter,” and will come with a card with the name of the one who sponsored it, so the person receiving it will know that somebody out there cares about them. “Sometimes, a blanket is the difference between you surviving the night, or not,” said Wooten. Wooten asked the assembled students what they would do if someone gave them $36,525, but that was the only money they would ever receive for the rest of their lives. Would they spend it all at once, or use it wisely? Wooten explained that, if any of them are lucky enough to live to be 100, that’s how many days they will spend on Earth, and that they shouldn’t be wasted.